Electrolytes are found in sports drinks and are for re-hydrating the body and replacing minerals after exercise. Most drinks contain sodium and potassium salts to replenish the body’s own water and electrolyte levels. They also have large amounts of carbohydrates to provide energy. Without the correct balance of these minerals, you will not be able to get the full effect of rehydration. Hammer Nutrition delivers this better than anyone I know, in their product Endurolytes, which is in capsule or powdered form. An effective drink should have a hearty balance of sodium chloride, calcium, magnesium and potassium, manganese, vitamin B-6, and L-Tyrosine. I used to use Emergen-c, but after a few days I was normally swollen. It is a good product, but not what I needed for days on end. You'll come across many drinks and products claiming to be a great replacement, but be sure to read on to make sure your supplement measures up and gives you the best performance. WHERE DO YOU FIND ELECTROLYTES? The average person can find plenty of minerals in common dietary foods such as fruits and vegetables, nuts, beans, grain breads and cereals, and dairy products. With athletes though, it is necessary to seek out other sources for electrolyte replenishment in order to keep a healthy balance. Drinking 16 -20 ounces of fluid per pound of body weight lost during the strenuous exercise is necessary. But water alone will not replace your electrolytes. You need a specific drink or pill formulated to replace the nutrients lost. 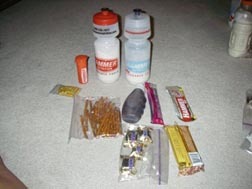 In extreme sports, it is best to rely on a sports drink or a supplement containing sodium and minerals. If you use a sports drink from Hammer, which is what I recommend Sustained Energy, Perpetuem, and HEED all have minerals in them. They will not always have quite enough of what you need on a hot or humid day. You can however reduce the amount of Endurolytes or your favorite pill when you are using these as your fuel/calorie source during extreme exercise. 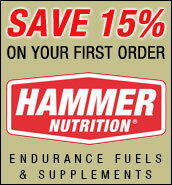 Hammer Nutrition's, Endurolytes, is a full-spectrum, rapidly assimilated supplement. This provides the body with the minerals it needs to maintain optimal performance of important functions for the body such as muscular contraction. This helps prevent cramping. When choosing a product, be sure to read all the labels carefully for content. You will want to use the smallest effective amount since too much sodium therapy can cause cramping, nausea, and stomach sloshing. I have found that using 1 every couple of hours is good for me in normal conditions. In extreme heat I have used up to 4 per hour! I thought this was a great product and look forward to using it in long races on a cold night. 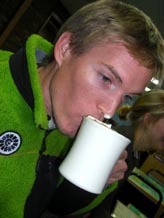 Clif’s Electrolyte-laced Hot Cocoa— is a hydrating and refueling drink. The good stuff is hidden in hot chocolate! You add 8 ounces of hot water to this powder, and you have a hot chocolate that replenishes and hydrates you. The gear junkie tried a few hot shots and said Not bad medicine at all.